Guilty as charged, Robert. Sorry you couldn’t find the information you were looking for and that’s probably because I’ve talked about it here, but the actual plans and most photos are on my Log Furniture Directory website. If this is the project you were referencing, here’s what you need. I built this for my bride a few years ago. She had a need for an over-sized hutch where she could display her china and glassware, but wanted some deep storage space for large appliances. The cabinet is over 5′ in length and over 6′ tall. The top cabinet rests on a ‘shelf’ supported by the 4 logs so that it can be removed. The cabinet base has only one drawer, leaving the entire space open for storage. 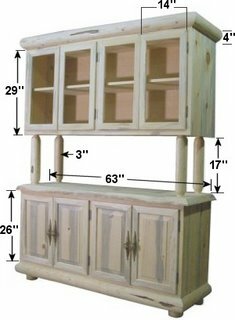 If you want to see detailed pictures and descriptions for this project, see this rustic log china cabinet. This was a wintertime project for me, which is my favorite time of year to work in my shop. Nothing’s better than having a fire roaring in the woodstove, my favorite tunes playing in the background and the smell of sawdust and coffee. Does life get any better than this? If you want some other ideas for some winter shop projects, I’ve shared a couple of my favorite DIY projects here. If you aren’t the DIY type, but are looking for log or rustic decorating ideas, my favorite online store is Black Forest Decor for cabin furnishings. .